In a world of constantly shifting borders it is often difficult to trace family lineage back through the destruction of the two World Wars that marred the 20th Century, especially in Europe. Throw in Russia's 70 year foray into Communism, along with these shifting borders, and you can run into a real puzzle! 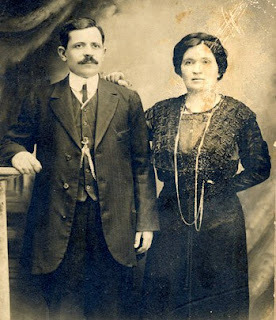 When William and Esther Marcus left Poland for America around 1911, they left Poland. When the Russian Revolution was over and the First World War had ended, the borders had shifted. The same thing happened in the Second World War and then again later, when the Soviet Union collapsed in the late 1980's. I wanted to share with you some new family history I have discovered. As you know, William and Esther were from Kishinev (Chisinau), Moldava. infection. She died a baby, but was born before Minnie and Sophie. Noticed how many children were named Pinkhos and Yankel or a variation of...interesting, uh? So, we have gone two more generations on Esther's side! With this new information, Jana has established my family tree as far back as the 1840's on the Marcus (maternal) side. The Henkin side of that tree is shrouded in mystery with no one left to tell the story. And anyway, I like the mystery better, as it probably trumps the reality. On my paternal side, we have information and Census forms dating back to the 1850's for the Burke's (my Dad's maternal side), and on the Williams' side we can trace our roots to the mid 1800's in Wales and England.